'/ft -Thanksgiving Holiday Early Edition l'P: Trustees Draft Donation Plan At their meeting last week the board of trustees agreed to a proposal that each member "consider very seriously" contributing one per cent of his productive capital Peruzzi Suicide Former student Leo Peruzzi took his life yesterday morning, friends have leamed. Peruzzi was a member of the Class of '67 but left last year without a degree. He was in his second week of basic training at Fort Bragg, N.C. Details of his death or of funeral arrangements were not available at presstime. Eulogy Preliminary observation--A state to avoid: isolation. Another preliminay observation-A feeling to avoid: desperation. Teilhard de Chardin to the college during the coming year. According to Vice President Paul Davis, trustee George G. Collins, who made the proposal, estimated the college would gain from a half million to a million dollars if most trustees participate. Davis said the proposal called for contribution of the capital itself (e.g., stocks or bonds) rather than cash income from capital. He said it was the feeling of the board that the plan could "go a long way" towards meeting the college's financial needs for the coming year. Nineteen trustees attended the meeting, Davis said, and the other trustees are being notified of the plan, which, Davis stressed, is a purely voluntary one as far as the individual trustees are concerned. In other action, the trustees elected Wilton D. Cole of Morristown, N.J., to the board as its 33rd member. Cole, whose daughter Pat is a second-yearstudentllere, is a lawyer who has spent many years in the publishing business. He graduated from Harvard Uni versity in 1923, was a Rhodes Scholar at Oxford in 1926, and won his law degree at Fordham in 1929. He is currently a trustee at the American University in Cairo, and at the New School for Social Research in New York. Cole seiVed as chairman of the board of the publishing firm Crowell-Collier Co. from 1957 to 1964. He is chairman of the New College parents' organization. Thursday Is Holiday Thursday, Day, is a holiday for New College students. A number of students will spend it elsewhere,. however. A mass exodus, as in earlier years, is expected. For students staying on campus, a special Thanksgiving dinner will be served from 4 to 5pm. The only other meal of the day willbe brunch, served from 8:30 to !1:30am. Fridaywillnotbe aholiday, however, although class attendance is expected to be low. POulson Library assistant Tom Lawson checks in some of the many books being returned to the library as students leave for the Thanksgiving holiday and the independent study period. November 24, 1967 Concert Schedule Tickets for the Florida West Coast Symphony Orchestra subscription concerts are available in the Humanities office. The concerts this season will be performed on the following dates At the Bradenton Municipal Auditorium, Saturday, Dec. 2, 1967 and Feb. 9, 1968, both at 8:15pm. At the Sarasota Memorial Auditorium Sunday, Dec. 3, 1967 at 3pm, andS:turday, Feb. 10, 1968 andSaturday, Mar. 23, 1968, both at 8:15pm. At the Neel Auditorium, Ma1a tee Junior College Sunday Mar. 24 at 3 pm. Season memberships are: reserved section $9; general admission-adult $6, student $3. Tickets may be used for concerts in either Sarasota or Bradenton. Naval Grant Acceptance Defended College Examiner Dr. John French defended his acceptance of a research grant from a department of the U. S Navy, saying his purposes were to serve civilization, not to advance the cause of the military. "The results of the study will be published and sent around to other universities and colleges, he said, adding that the schools, Against not the navy would benefit from the report. The $9, 000 grant from the office of Naval Rcsc arch will be used to identify motiv:tional factors among New College students. Second-year student Jon Shaughnessy and several University of Florida students, including the FPC Confinns Offer Of Seats to Europe Florida Presbyterian College has confirmed its offer of seats on charter flights to Europe and the Far East this summer for New College students. Students with approved study projects m:ly' :pply for seats on the flights at special charter prices. Students who would like to spend a year of work and study in Scandinavia are invited to apply to the Scandinavian Seminar Program. According to Mrs. Mary Flmen dorf, the Seminar will give thirty students from the United States a Elected chance to study at special schools in one of the Scandinarian nations. Students with study projects or senior theses in the humanities or social sciences are eligible, and they should apply by Jan. 1. There is no language pre-requisite, but language study will be offered. Some financial aid is available, Mrs. Elmendorf said. Literature on both programs is available in the language laboratory, and details are available from Mrs. Elmendorf. Editor Chages chapter chairman of Students for a Democratic Society, Alan Levin, had called the meeting Monday to discuss whether the grant implied French complicity with the aims of the military. Levin told French the question at issue was "whether or not the conclusions of your study could become a tool for carrvinll out United States policy, and whether you yourself become a tool of the government by accepting their money. French, himself a conscientious objector, said the ONR had told him only to include a paragraph in the report stating how the Navy might use his findings; he said he frankly thought such uses would be few "since I can hardly think of any other group more unlike sailors than New College students." "Cynicism, nihilism, withdrawal and despair are not tmknown among those who have most clearly succeeded in the largely verbal education they have received. But when we examine the meaning of this disaffection anong those who live by words, we must recognize the complete absence of any formulated alternatives to the long tradition of symbolic values that represent America. Disaffection is a personal, not a social or political phenomenon and this is in many W:ly'S unfortunate ... 11 McLelland Education in the New America In Staff Reorganization Shaughnessy said after the meeting he wouldattem pt to get enough students to boycott the experiments to force cancellation of the study. I often find myself pointing at things, instead of talking. I often find more said in emptinesses, and the edge of something or its end. Leo knew best of that edge in the center. No one else so artfully or expressively skirted its growing perimeter. It is given to few to so softly call out their secrets. We must look for old novels and borrowed cigarettes. Details rearrange them s e 1 v e s. Deftly sketched portraits will continue to age in our e y es. --DAVID PINI Third-year student Laurie Paulson was elected editor of The Catalyst at a meeting of the newspaper's staff Sunday. Paulson will succeed Kenji Oda, editor for two terms, who will take a year off to write a Senior Thesis, work in the newspaper business, and travel. Paulson's appointment as editor will be effective the next issue. Oda will serve as an editorial advisor during the Independent Study Period. Paulson has worked on The Catalyst staff for two years. He served as Associate Editor during Oda's editorship, was editor of The Catalyst Literary Supplement, and his column "On Campus" is in its third ye:r. Other appointments announced include first-year student George Ka1e as Advertising Manager, second-year student Katie Smith as Qrculation Manager and secondyear student William Hedrington as edtor of the literary Supplement. 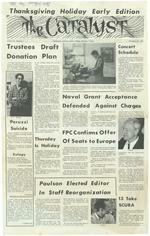 In accepting the editorship, Paulson said "some changes" in the paper are contemplated. It was also reported the paper is in "good shape" financially. Paulson 13 Take SCUBA Thirteen first-year students have successfully completed a course in SCUBA diving. The course was taught by Arnie Tresch and Mrs. Pat Bird. The three class sessions were held at the college pool. The course concluded with a test. An additional course may be offered in December or January. Page 4 The Catalyst Soccer Team Edges Circus To Take The New College squad edged the circusteam 3-2 Sunday after noon, claiming the second victory in a 3-game series. Tim Snyder scored the first goal of the game with a shot outside the Big Area ten minutes into the half. Goalie Don McDondd saved the slim lead with an amazing block of a circus performer's penalty kick. The 1-0 edge had little chance to settle before the opponents slammed in two goals of their own. despite the enlightened efforts of New College's defense. Brooksie & Stub Haralao11 The Conversation Piece tnc Antiques 'W Unusual Deco Interior Decorating 1288 First Street Phone 955-7530 Announcing Mr. Bud Field Now with FAY'S BEAUTY SALON 1034 Colleton Driye 355-6296 Specializing iii Hair Shaping and Styling Open Nights -Behind 7 1 I and 4 Cookies 41 North Trail for the latest in men's and women's dress andcasual shoes 1425 MAIN STREET 958-1213 CORTEZ PLAZA 746-5977 SOUTH GATE PLAZA 955-5440 UNITARIAN CHURCH 3975 Fruitville Road Sunday service: 10:30 a.m. Sermon topic for Sunday: "THE QUEST FOR IMPERFECT PERFECTION" Nursery and Church School: 10:30 a.m. Best ol3 Series In the 2nd half forward Steve Romero stormed into the goal with his own brand of kick-and-run. Two replacements came into the game, forwards Cope. Garrett and Miguel Tapia. Garrett overcame the opposition with a well-placed goal to end the overtime game. With the combined efforts of George Duffee-Braun and Tapia, the circus performers' offense seldom crossed the middle field line. Coach Tapia especially commented on the good containment of the front line by Gary Williams, and on the "soccer sense" of Steve Patronize Our Advertisers THIS CH3 I -C-CH I 2 CH3 Romero. Jeff Jordan became the first casualty Of the season, leaving in the 2nd half with a leg injury. After the game, Tapia happily r e m a r k e d that "Cope Garrett, Snyder and McDonald all played a beautiful game. The circus team is very impressed with the develop ment of our team. And so am I!" A game with Florida Presbyterian is in the offing, possibly for the 2nd or 3rd of December. CYCLE SALES, INC. 2530 17TH STREET "'THE SOUTH'S BEST SERf/ICE" CH3 I -C-CH3 \ H AND SERVICE IS WHAT YOU GET AT TRAIL PLAZA TEXACO U. S. 41 & MYRTLE DOES THE DINING HALL HAVE PERSONAL SERVICE? No. That's why you should eat at the Old Hickory Rst., (1 block south of the college on the Trail.) It's South Hall Remodeling of the Sanford House--it is now officially known as South Hall--is nearly completed. The exterior of the building has been cleaned up and repainted. The intemal structure has been altered extensively. In pictures, clockwise from left: a front view of South Hall, with College Hall in the b ackgrotmd; two views of the main reception are a on the grmmd floor. South Hall will house the college's administrative offices and some faculty offices. COCKTAILS AT ECOPPER 3428 No. Trail 355-3446 FINE DOMESTIC 4 t570 Nc:.. Lockwood Ridge Rd. 955-3446 IMPORTED LIQUORS Barry Art Supplies,Inc. EVERYTHING FOR THE ARTIST 955-4159 114 North Orange Ave. Sarasota,Fia.